How Mumbo-Jumbo Conquered the World: A Short History of Modern Delusions should be read for the title alone, but the delicious catchphrase is not all that's great about the book. It's opinionated. It's judgemental. It's mildly offensive and massively politically incorrect. In short - it's fabulous. Francis Wheen takes on contemporary gibberish and sends it packing. Of course, you might not call his target ideas gibberish at all - the world is full of funny people - but he strikes uncannily close to the mark of my own sociopolitical opinions, so I don't feel offended by his sarcasm. How Mumbo-Jumbo Conquered the World ridicules and/or questions things like UFO abductions, motivation coaching, murky alternative medicine, post-modernism, doomsday prophecies, religious fanaticism, free market and rhetoric of Thomas Friedman. Even if none other item of this list could chime in with me, which isn't the case, the last wins me over in an instant. To be fair, Wheen probably uses a lot of rhetorical tricks himself. I kind-of believe in the quality of data he supplies, but I'm sure he remained silent about any potential counter-arguments. Oh well. No book can be considered the truth revealed and if I'm to listen to propaganda (unavoidable in our merry PR reality), I'd rather take something gutsy and no-nonsense than tasteless pap that's served elsewhere. You might want to avoid the book if you strongly believe in dogmatic religion of any sort, New Age remedies, inevitability of capitalism rampant, the absolute American hegemony or creationism. You probably should avoid it if you can be easily depressed. 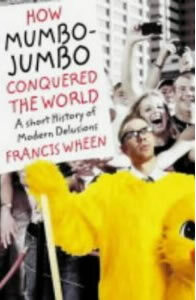 How Mumbo-Jumbo Conquered the World is witty and funny, but it is not a happy book. After all, mumbo-jumbo seemingly does rule the world and it's hard not to draw grim conclusions if you're a rational, thinking creature. Some parts of Wheen's volume scared me shitless, some merely made me hope that I'll never find myself geographically near particular varieties of madness. Hardly any made me look into the future with optimism and enthusiasm. See me sigh. Depressing or not, the book is great. Three hundred and something pages of venomous rant against stupidity and woolly thinking. You can give me one of those anytime.